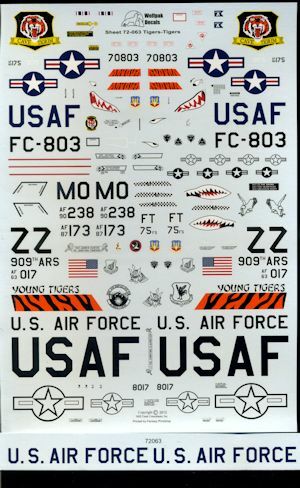 Wolfpak's latest sheet has five subjects on it, all with a tiger theme. The first is an F-102A from the 460 FIS at Portland, Oregon in 1962. This aircraft also has yellow and black wing tip stripes. Next is the first of two F-15Es from the 391 FS 'Bold Tigers'. 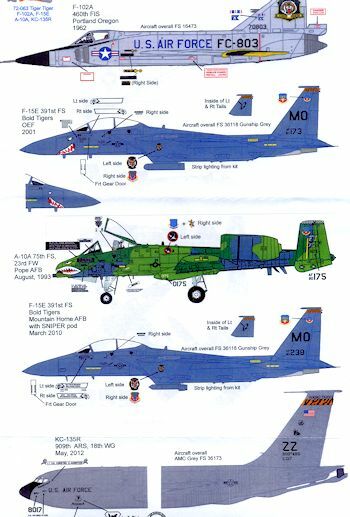 This initial aircraft is replete with a sharkmouth and participated in OEF during 2001. The other carries a SNIPER POD and is from 2010. The A-10A was with the 75th FS at Pope AFB in 1993. It is in the older lizard camouflage scheme. Finally, the big boy of the set is a KC-136R from the 909 ARS, 18 Wing based at Kadena during mid 2012.